The name "Kuala Lumpur" means "muddy river" and was given to the city by the miners, who made a settlement around 1860. The miners and merchants were in search of pewter and built their houses on the banks of the Gombak river and the Klang river. There both rivers meet . Nowadays the Jame Mosque is situated on this place. This metropolis in Malaysia has about 2 million inhabitants and has many modern buildings. Travellers, like me, only stay for a few days in the city. So I will restrict myself to the highlights, because I can't be complete. Every time when I return to Kuala Lumpur, I discover a new spot, which is worth a visit. There are many good hotels in Kuala Lumpur. I won't trouble you about the number of stars they have. You can easily find that in any hotel guide. It is ,however, important that the hotel is situated in the Golden Triangle of the city. Then you're close to the shopping centres of Sungei Wang, Bukit Bintang, Lot 10 and Imbi Plaza. And you're within walking distance of the famous Petronas Towers (the highest building in the world) with its shopping centre Suria. Mostly I visit the highlights in the morning. It's quiet then and not so hot. If you think it's too hot: take a taxi! Some hotels in the Golden Triangle are: Istana, Park Royal Regent, Federal, Mutiara, Equatorial, Melia, Holiday Inn, Ritz-Carlton, Concorde and Capitol. Notice: this list is not complete. Morning : When you fly with Malaysian Airlines you'll probably arrive at KLIA (Kuala Lumpur International Airport) early in the morning. This is an ultra modern airport, that looks like a space-station. The trip by car to Kuala Lumpur takes approximately 11 hours. This may look like a long time, but the surroundings are so impressive, that you won't notice the long ride. You'll arrive in your hotel around 9 o'clock. It's likely that your hotel room is already available, if not you'll have to wait till noon. Late afternoon: Discover the neighbourhood of your hotel. If you're hotel is in the Golden Triangle, you can go to the shopping complex of Sungei Wang. There you can discover what's for sale in Malaysia. Are you a computer freak Then go to the Imbi Plaza. It's not a big complex, but there are 3 levels with computer equipment and software. Imbi Plaza is next to Sungei Wang. Evening: Take a taxi around 18.30 to Petaling Street. Petaling Street is in China Town . Here you can visit all the little stalls, which they have placed in the middle of the street. Almost everything is for sale here: video-tapes, cd's, copy watches (Rolex, Gucci, Cartier, Breitling etc. ), t-shirts (Nike, Reebok, Billabong, Quicksilver etc. ), dvd's, socks, belts, bags, purses and much more. Don't forget to bargain about the price! And of course you can have dinner in China Town. Don't be choosy. Every hawker stall is okay. Don't be afraid to eat here. Mineral water is for sale in every shop. Buy Malaysian water and not the expensive imported French water, like Evian or Perrier. You can drink the water from the tap, but it's not so tasty. It tastes of chlorine. Morning: Take a visit to the Petronas Towers (452 meters high). It's not that far and it's a nice walk. You can't miss it, because everywhere you go, you can see the impressive building. Sometimes the top is surrounded by clouds. On the ground floor of the Petronas Towers you'll find the Suria shopping complex with its 6 levels of beautiful and exclusive shops. Admission is free and the elevator will bring you to the bridge (at 170 meters), that connects the two towers. You have a wonderful view over Kuala Lumpur. There's also a restaurant on this level. Afternoon: Take a taxi and visit the Central Market . It's in a great hall and has two levels. There is much to see here and you can have your lunch on the second level. In the old days the Central Market was a wet-market, where they sold fish. Now you can buy your souvenirs and many, many other things. Don't hurry. Take your time and look at the colourful shops. After your visit you can go to the Masjid Jame mosque. It's within walking distance. Not far away from the mosque is the Court of Justice and the Selangor Club (cricket field) . Take a lot of pictures and have them developed in Malaysia. Evening: Choose a nice restaurant or go to the hawker stalls for your dinner. Jalan Alor is perfect for a very nice dinner. Here you get used to have dinner at Hawker Stalls. Afterwards you can have a cup of coffee at Starbucks! You can go to the Zoo Negara in the evening. That's very nice, but it's not opened all year round. 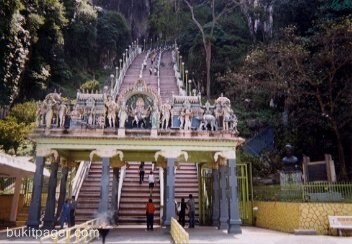 Morning: Take a taxi to the Batu Caves (click), but don't hesitate to take the local bus. It's cheap and it is a nice experience. At the Batu caves it's a pretty heavy climb upwards. Exactly 272 treads. Going downwards, you'll be greeted by a lot of monkeys . The climb is heavy, maybe you have to rest halfway, but the view upstairs is spectacular. Afternoon: Visit the telecommunication tower, named KL-Tower . Here you have a wonderful view over the city. The KL-tower is 421 meter high and because it's built on a hill, it's higher than the Petronas Towers. Evening: If you haven't eaten at a hawker stall yet, you must try it this evening (Jalan Alor). Visit your favourite shopping mall or go the Petaling street.